5 x LC CAC (3x Finland, 2x Sweden), 1 x CACIL (LC), 2 x reserv-CACIL (track & LC), winner of Nordic LC Championships 2011, 1 x conformation CAC, 8 x conformation reserv-CAC. Holder of race track license and lure coursing license. Eyes checked clear June 2011 and February 2013. 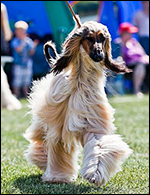 Best Lure coursing beginner Afghan hound in 2011 in Finland, Lure coursing Afghan hound of the year no 3 in 2011 in Finland, Track racing Afghan hound of the year no 3 in 2011 in Finland. This page is all about Micke! Micke, officially Yhazin Freelancer, was born on the 25th of May, 2009 in the south of Sweden, in Liza Lopez's kennel Yhazin. He has 7 brothers and 3 sisters. All brothers are in different shades of golden and red with black masks and the sisters are golden with black mask, silver with black mask and black and tan. Micke was the fifth male to be born. Dam of the litter is Multi Ch Yhazin Drums of Africa and the sire Tuohi-Tikan Teikkari. I went to Sweden together with Tuohi-Tikan Teikkari's owner Merja Haapoja and her friend Laura Pennanen to look at the puppies and pick up our puppy and the one going to Merja. It was a really not easy to choose the puppy, all the males were so similar to each other in their bodies, with only minor differences. I had a hard time choosing between the white male (male number three) and male number five, and in the end it was the nature of the puppy that became the decisive factor. Micke, male number five, is a very active young man, with a lovely attitude that made you see him all the time, even in that big puppy pack. He is very keen on the lure, and seems to learn new things quite fast. He was often part in puppy wrestling, but he was as keen on jumping up in people's laps, from where he prefered to climb to the shoulder in order to get a better view. 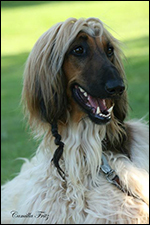 A mountain Afghan Hound indeed! The trip home was long and wearing, but the puppies managed the over six hour long drive from the south of Sweden to Stockholm very well, and didn't mind at all being in the ship to Turku. They both showed how curious and brave puppies they are by being interested in all new sounds and smells, and not really being afraid of anything. In Turku waited my husband to take us home to Espoo, and Merja and Laura continued their trip to Tampere. Right now Micke is just eating, sleeping, playing and running around, and charming people he meets. We are eagerly waiting to see what kind of dog personality he will grow up to be, and which activities that in the future will suit him. But right now we are just enjoying having him around. Thank you Liza for this lovely boy! Update on Micke: The boy has reached the age ten months, and man has the time flown by fast! Micke is right now just over 70 cm high and weights almost 29 kg. He loves to run, and has developed really big muscles both front and behind. He is much faster than Ludde, and has a lovely running style. He is very keen on the lure, and I look very much forward to see how he will do this incoming summer in race practices. There will be no time for competitions this year, Micke hasn't the age for that, but I hope we will managed to try for the license in the autumn. Then if the winter goes well he will be ready for competions in 2011. 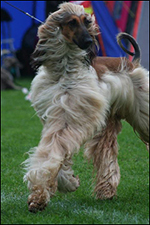 Micke has been to four puppy shows during the winter, and went three times Best Male-2. He wont be shown in the official classes until the end of May, and then he will take part in some more shows during the summer. 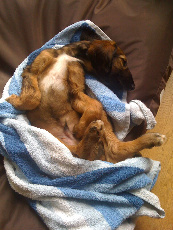 We will also take part in a puppy agility class starting in the end of April. Micke did already last autumn test some agility obstacles, so it will be fun to see what he thinks of it all now when he can be allowed to do some more. Summary of 2010: Micke has during the summer taken part in race track training, and has run 350 m in 30,0 s and 30,2 s, both very competitive for Afghans, and especially for males (the track record for the track were Micke has trained is 29,93 s). We are very much looking forward to the lure coursing and track racing season of 2011! Micke did end the show year of 2010 in a very nice way: Best Male 4 with reserv CAC under judge Raisa Savander at Helsinki international show. Summary of 2011: Micke did debut on the lure coursing field with a nice fourth place in a huge male class at the traditional Winter lure coursing competitions in Mustiala in March, only 3 points from CAC. In May he finished the track racing license runs, and made his track debut in the beginning of June. During the year he won three CAC, one CACIL and one r-CACIL from lure coursing. He also won one r-CACIL from track racing. A highlight of the year was of course winning the Nordic lure coursing championships and the title NordLCW-11 in July. 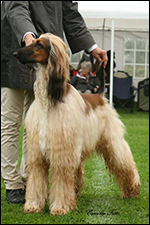 In conformation was Micke sparingly showed, but he received a r-CAC at the international show in Eskilstuna under judge Karin Hedberg, Sweden, and he was among the eight best in the huge open male class of 18 dogs at the Finnish national speciality in June under judge Iren Rohrer, Switzerland. Summary of 2012: Micke injured the inner toe of his right paw in January 2012, and struggled with muscular problems caused by that and an old muscular injury all year long. He never really got in shape for the running season. He lost a lot of coat due to stress and medications. 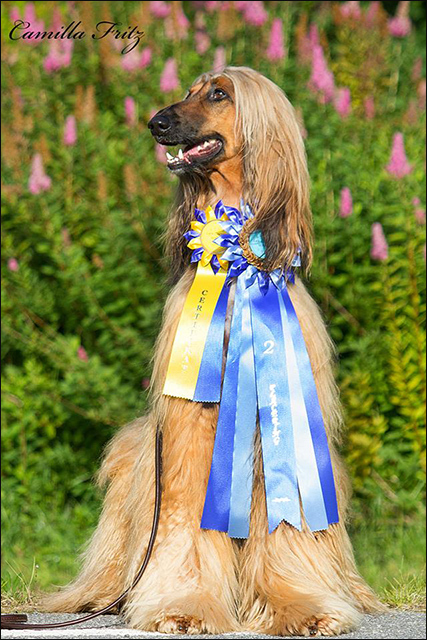 Still, he was second in huge open class att the Finnish national specialty, and received a reserv-CAC in Ransäter, Sweden. Micke's problems should most likely have gone undetected if I hadn't in August 2013 come in contact with the canine physio therapist Therése Asplund. Therése discovered the old injury that together with the injured toe and the compensating Micke had done to ease his walking made Micke so uncomfortable. Micke had during 2012 before that visited several physio therapists, but nobody had done a througout enough examination of him to discover where his problems really were. Many thanks go to Camilla Fritz, who introduced me to Therése! Summary of 2013: Micke took part in a couple of shows, receiving two r-CACs, and a CAC from lure coursing. Summary of 2014: A repeat of 2013: Micke took part in a couple of shows, receiving two r-CACs, and a CAC from lure coursing. Micke received BM-3 and CAC at the int show in Mikkeli, Finland, 25.7.2015. Judge was Hannele Jokisilta.